Many marketers love to use software that will extract emails using keywords which drill down into their specific niche to provide them with a starting list to market to. Plain and simple, it saves a lot of time since they can get their offer in front of many eyeballs for little cost. However, there is a specific process that needs to be followed in order to use these lists successfully. And that also goes for lists one might purchase. Newcomers to email extracting tools should follow these very simple but effective steps. Remove duplicate emails by using this free online tool. Run the email validator software to ensure the emails are at least real ones. 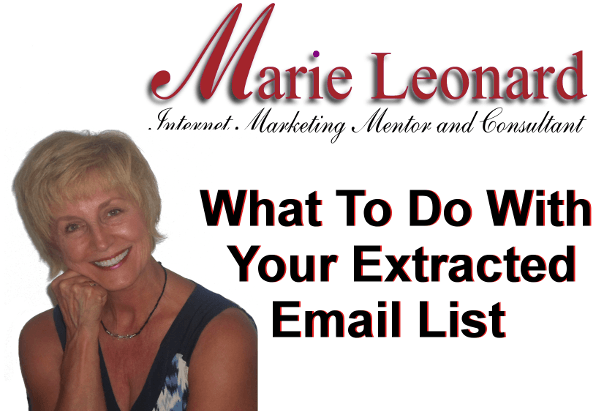 If your list is thousands of emails long, split it into batches of 5000. Just Google “free list splitter” software and you will find many that do the job quite well. The next section will justify why you should use smaller list segments for your marketing. Unfortunately, once a list has been extracted, eager marketers start to spam their offers to these email recipients only to get themselves labelled as spammers or worse, get their accounts banned. Avoiding spam issues is a fine line but it can be done. First, you have to become familiar with what is allowed in your country. Please visit NoSpamSolution and read what the US or Canada requires from you to avoid spam issues. Second, you have to use a reputable service. That’s why I always recommend Jmailer as my service of choice. Manage an unlimited number of contacts and lists, even BOUGHT or extracted lists. Import contacts from your existing lists, with no limits on uploads. Segment lists by subscriber similarities and activity (such as opens, clicks, bounces and more. Create multiple autoresponders with intelligent triggers. Filter your recipients by their data and activities. Create web-based forms for use on your own website. One very special feature found in Jmailer, is a no spam list directory that each email will get checked against. It ensures your emails don’t trigger spam bots that may get your account closed or banned. I am currently working with a client using this service and showing him how to properly set up his sales funnel, how to get the most out of his collected email list and how to setup marketing campaigns that will get people to click on his link and get on his list for continued followup. On his very first campaign, he got a whopping 14% open rate. This is unheard of especially with emails that were actually collected using my Targeted Search Extractor software. These emails did not even have a name to identify the receiver. Done correctly, this process can give great results and could potentially be the beginning of building a targeted list of prospects ready and eager to have YOU be their go to person.